​If you haven't done so already, please take a look at the Gallery page before you submit your inquiry. 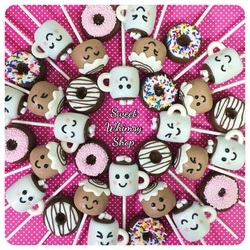 On the Gallery page, you can see cake pop designs grouped by price category. Currently available only through pre-order, or at local pop-up or market events. Sweet Whimsy Shop is licensed and operates as a Cottage Food business, so there is no "brick-and-mortar" store for clients to visit. Free pick-up is available in Richmond Hill, Georgia. Delivery to Savannah area locations may be arranged, with a minimum order and delivery fee. No shipping available. Thanks in advance! EVENT: Saturday, April 20th / Pop-up & Easter Mini-Market at Way Station Coffee in Richmond Hill. 9am-12pm. April 22-28 - BOOKED THRU APRIL 24th. Limited availability after. EVENT: Friday, May 3rd / First Friday Pop-up at Dot & Army in Brunswick, Georgia, 5:30pm-8pm. EVENT: Saturday, May 11th / Market event at Hipster Hound in Savannah. Details to come. For more information, or to place an order. Please submit inquiry below. ​You can expect a reply within 24-48 hours. If you haven't received a reply within 48 hours, please send an email directly to SweetWhimsyShop@gmail.com. Thanks in advance! Pick-up in Richmond Hill is free. If available, delivery to Savannah, Pooler, and surrounding areas has an order minimum, and may require an additional delivery fee. Include style & quantity of cake pops. Including a budget will help me recommend appropriate styles/combos/quantities to meet your budget needs.